Is Your Furnace Ready For Winter? | Bills Sales and Service - Refrigeration, Ice Machines, Heating and Air Conditioning in the Branson - Tri Lakes Area. It's time to change your furnace filter! Remember, most air filters need to be changed at least once every 30 days. They need to be changed more often during summer and winter months when your system is running almost constantly. 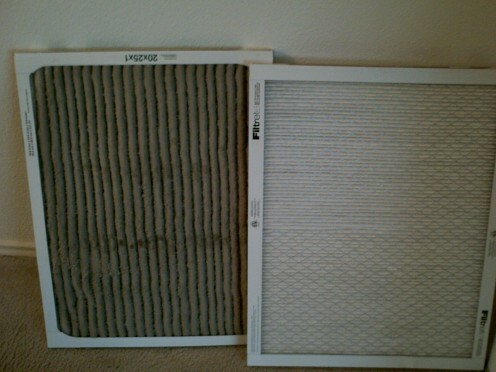 Aside from being good for your unit, changing your filter regularly is good for your health. Air filters are designed to trap dust, mold, pollen, and other indoor air pollutants. These pollutants can aggravate allergies or asthma. Dirty Filters will cause your equipment to work harder than it should. This results in energy waste and even possible internal damage to your air conditioning unit. Become familiar with the type of filter your system requires. If you have a washable, that is reusable, make sure it is completely dry before replacing. Disposable filters are not very expensive, especially when compared to the costs of having your unit serviced or replaced due to excess wear and tear. Unrestricted air flow to the outdoor unit is extremely important. Remove trash, leaves, grass and tree trimmings that are in close proximity to your air conditioner or heat pump. Any debris that collects around the air conditioner will cause your unit to work harder than intended, resulting in using more energy and higher utility bills.